I’ve nought to regret nor to lose. 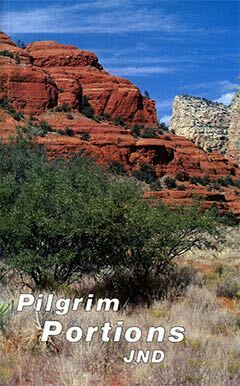 We are on a pilgrimage, and God makes us feel it in our circumstances. He detaches us from what is dearest down here; He weans us, and then without being aware of it, we ripen for heaven. I was always a solitary soul, thinking more for, than with people: but it is good to be more alone—most good, if it be more alone with Christ. What a place that is! “God who comforteth them that are cast down.” Ah, I say, it is worth while being cast down for such comfort as that! … and think what it is to have God occupying Himself with us in our sorrows when we remember who He is. I feel increasingly, what we all know, that the work for God is the work of God. When the soul is down, like a ship when the tide is low, it is in danger of shoals and sandbanks; but when the tide is up there are no sandbanks, because the ship is lifted up above them all. Thus when the soul is happy in Christ it will go on peacefully, independently of all the trials we may be called to meet with in our fellow saints. … And thus going on in the tide of divine goodness, forgetting everything else, we can walk happily together, being occupied with Christ, and not with each other. If Christ be between our hearts and the suffering, instead of the suffering getting between our hearts and Christ, we shall find the place of suffering to be the best place on the face of the earth for us, as all suffering will then bring us nearer Christ. Be assured that God does more in us than we do for Him; and that what we do is only for Him in proportion as it is He Himself who works it in us. The truth needs not man: man needs the truth. Sweeping away snow is long work; if the sun is well up, it is gone. A night covers the earth afoot deep—what millions of men could not do, a day takes it all away if God’s warmth comes in. Do not be afraid of … consequences. If we do right God will take care of them. I cannot do the work I did, but I have His work to do as long as He gives it to me. We should like to go always with a full, favourable wind, but this does not make a good sailor. Not a single thing in which we have served Christ shall be forgotten … all shall come out that is real, and what is real is Christ in us, and this only. I have often seen isolated souls, if they kept close to the Lord, making more progress than those who enjoyed greater spiritual advantages. The latter thought that all that they enjoyed was of their faith, when it was not, whilst what one possesses alone, at least one possesses with God.